The Trans* Education and Determination teach-in took place on Friday 20th May: the date on which a cancelled psychiatric event was intended to take place. It featured a number of talks, presentations and workshops exploring issues such as trans academia, counselling, psychiatric practice, and feminism. The teach-in was a great success, and will hopefully lay the groundwork for future such events. This community effort – organised on the internet by a loose team of volunteers – was a powerful rebuke to the medical and psychiatric institutions that claim to speak for trans people whilst denying us a voice. Trans* Education and Determination was originally envisaged as a response to the Royal College of Psychiatrists’ event Transgender: Time to Change, which was due to feature two transphobic speakers: Dr Az Hakeem and Julie Bindel. This event was cancelled following the announcement of a trans community protest and the withdrawal of support from Charing Cross Gender Identity Clinic. However, the decision was taken to go ahead with the teach-in. Almost thirty people arrived at King’s College London for the launch of the teach-in on the Friday morning. This number gradually grew throughout the day as attendees freely came and went from the open event. Cheryl Morgan, Roz Kaveney and Juliet Jacques volunteered to act as chairs, taking turns to introduce speakers and facilitate questions and discussions. PhD student Ruth Pearce informally opened the event during the introduction to her talk. She explored the theme of articulation, arguing that the teach-in offered a valuable opportunity to give voice to trans experiences and perspectives. Ruth’s presentation offered some background on the evolution of trans academia and suggested that the internet has played a particularly powerful role in shaping the recent history of trans identity and community. She then provided some details of her planned research project, which will explore trans experiences of primary healthcare in the United Kingdom. Attendees asked about Ruth’s research methods, which involve acquiring data from online communities. This led to a valuable discussion that explored the potential advantages, pitfalls and ethical implications of internet research. Lunch was followed by a talk given by psychologist and sociologist Dr Lyndsey Moon. Lyndsey drew upon her experiences as a queer child, a practising counsellor and a teacher to critique the rigidity and contingency of psychiatric categorisation, particularly that found in the American Psychological Association’s Diagnostic and Statistical Manual (DSM). This talk illustrated the DSM’s failure to account for fluidity and complexity, and the danger this poses for professional understandings of gender and sexuality. Lyndsey also explained how her own research had demonstrated that psychologists and psychiatrists receive practically no training on the impact of social phenomena such as gender, sexual orientation, disability, race and religion. She argued that psychology and psychiatry remain broadly white, middle-class and abled professions in the UK. Attendees expressed their broad agreement with Lyndsey’s points and joked about artificiality of psychiatric classification. A number of individuals explained how they’d been treated poorly within academia because of the transphobic assumptions made about them. Academic Natacha Kennedy provided an extended examination of Dr Az Hakeem’s 2010 paper “Deconstructing Gender in Trans-Gender Identities”. In this article, Hakeem argued that trans people reinforce gender norms, and advocated group therapy as an alternative to transition and stated. Natacha questioned the logic of Hakeem’s claims, and demonstrated how he failed to provide evidence about many of his statements. Her frequently amusing deconstruction demonstrated how the paper relied greatly upon ideological statements rather than evidence-based study. The presentation concluded with some background on the approach of Kenneth Zucker, a practitioner with somewhat more extreme views than Hakeem who is contributing to the next edition of the DSM. Natacha explained how her own research findings contradict some of Zucker’s claims during an anecdotal account of a previous trans protest. NUS LGBT representative Kai Weston shared his perspective on the intersection of trans experiences and feminism. He provided a refutation of the radical feminist position held by Julie Bindel, drawing upon examples of gender variance from non-western societies and within trans communities to counter her argument that trans people reinforce binary gender norms. Kai’s thoughts provided the introduction to an extended group discussion of intersectionality and the impact of feminist theory on trans lives. Attendees asserted the importance of countering sexism and misogyny whilst exploring the relative benefits and disadvantages of different feminist positions. Issues such as the invisibilisation of transmasculinity and the tensions between trans and intersex activism were also touched upon. Journalist Jane Fae provided the final talk of the day, a deeply personal critique of psychiatry. She explained how Freud in particular relied upon deeply unrepresentative samples in order to justify his theory, suggesting that Freudian psychiatry therefore owes considerably more to abstract theorising than to empirical evidence. She provocatively claimed that the psychiatric profession and its accompanying academic literature is a psuedo-scientific scam. Jane finished her talk with an emotional attack upon the psychiatric gatekeeping that requires trans patients to spend a considerable amount of time and/or money in order to pursue a physical transition. The audience broadly welcomed the uncompromising central thrust of Jane’s argument, although there were some counter-examples illustrating benefits that psychiatry can bring. There was some confusion over the boundaries between psychiatry, psychology and psychotherapy, with a number of suggested solutions proposed. Attendees broke away for individual discussions before the day finished with group feedback on the day, in which everyone present was offered the opportunity to share their thoughts and feelings. Positive criticism of the teach-in was shared with an eye towards similar events for the future. Some felt that a less academic or “studenty” feel might help appeal to a wider audience. A number of individuals argued that any future events should remain free, although the possibility of a sliding scale entry fee was also suggested. Many agreed upon the idea of holding future trans teach-ins outside of London, hopefully within a somewhat more accessible, non-university building. It was also felt that more could be done to reach out to groups under-represented at the event, such as minority ethnic trans people. Everyone welcomed the positive, productive atmosphere of the event, and thanks were offered to the many volunteers who worked hard to make the day a success. 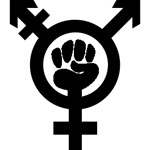 Trans feminist symbol designed by Helen G.